Sen. Barbara Mikulski, a leading champion of science and technology, has won battle after battle and is now at the pinnacle of power. Can she keep it up? When Republicans on the House Science Committee in June prepared deep cuts at NASA, slashing the agency’s climate-monitoring Earth sciences program in Maryland, Florida’s Sen. Bill Nelson, a former astronaut, could only chuckle: “You think Barbara Mikulski is going to allow that?” Nelson’s quip to an audience of aerospace executives and engineers underscored the priorities and power of his fellow Democrat, the senior U.S. senator from Maryland. 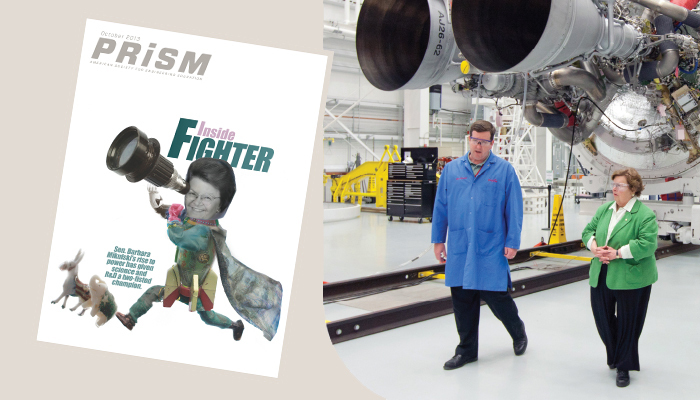 Though better known for feisty populism, feminism, and progressive causes, the four-foot-eleven Mikulski has long been a towering presence in the world of government-funded science and technology. Now, with added stature as chair of Appropriations, she can, as much as anyone in 2013 Washington, underwrite her enthusiasms with the government’s checkbook. The great-granddaughter of Polish immigrants, Mikulski recalls being inspired as a child when her parents, who ran an East Baltimore grocery store, took her to a movie about Marie Curie. Young Barbara decided she too wanted to be a Nobel Prize-winning scientist. “I begged my parents to buy me a chemistry set,” she says. Earning a C in college chemistry prompted her to pursue social work instead, but her interest in science persisted even after she earned a master’s and became a community organizer. She was accepted into a graduate program at the Johns Hopkins School of Public Health before her career took a decisive turn: A proposed 16-lane highway threatened to cut through her community, displacing families she’d worked with, including some of the first African Americans to own homes in the city. Her activist passions ignited, Mikulski successfully fought the highway, won a spot on the Baltimore City Council in 1971, and then, in 1976, won a seat in the U.S. House of Representatives. Mikulski’s advocacy for science and technology gained heft when she joined the Senate in 1986 as the first Democratic woman elected in her own right. She shrewdly eyed a spot on Appropriations and became a protégée of then Chairman Byrd. In two years, she leapt to the helm of the subcommittee that controls funding for NASA, the National Institute of Standards and Technology, the National Science Foundation, and other scientific agencies, many of them in Maryland, and used her growing clout to prop up, beef up, and sometimes rescue science and tech interests, all in the name of “jobs, jobs, jobs” — her longtime mantra — and innovation. An early proponent of a stepped-up national commitment to science, technology, engineering, and math, or STEM, education – “In order to out-innovate . . . we must first out-educate,” she says – Mikulski has, through the years, also steered billions to the National Oceanic and Atmospheric Administration (NOAA), most recently in the wake of Hurricane Sandy; pushed for sizable funding increases for the National Science Foundation and the FDA, and waged a hard-fought battle to double funding for NIH. Its federal check grew from $13.6 billion in 1998 to $27 billion in 2003. “NIH would never have been what it is today but for her stewardship,” says lobbyist Kelly. Nowhere has Mikulski made more of an impact than in space. “Every issue has one person who can be counted upon to jump up when it’s threatened. For space, it’s Barbara Mikulski,” says Keith Cowing, editor of NASA Watch. Since entering the Senate, Mikulski has doggedly defended NASA, especially the Goddard Space Flight Center in Greenbelt, Md., its hub for space exploration and scientific discovery, fighting off proposed cuts and once a threatened shutdown, and pushing for resources to expand its mission and capabilities. In certain spheres — planetary sciences and astrophysics, for instance — she’s helped Goddard, as well as the Applied Physics Lab, compete for missions with the Jet Propulsion Laboratory in California. Her name is synonymous with the Hubble Space Telescope, a NASA crown jewel, albeit one with a tortured history that ate deeply into Mikulski’s political capital. Hailing the Earth-orbiting reflector as “the greatest scientific instrument since Galileo’s telescope,” she fought to maintain development funding even as costs escalated. But after the telescope’s 1990 launch, when the first blurry images revealed a major flaw in its mirror, a furious Mikulski called the telescope a “techno turkey” and prodded NASA to fix the optics. The agency complied, installing what Mikulski called “the most expensive contact lens ever built.” Three more shuttle missions to service and upgrade the telescope over the next decade made it what NASA officials called “the most productive space and science mission” in the agency’s history. But Hubble’s troubles weren’t over. After the 2003 Space Shuttle Columbia disaster, then NASA Administrator Sean O’Keefe canceled all future repair missions to Hubble, citing safety concerns for the shuttle crew. Mikulski wanted a second opinion, and persuaded O’Keefe to seek an independent review before closing the book on the Hubble. In 2006, O’Keefe’s successor, Michael Griffin, approved a final shuttle mission to repair, upgrade, and extend the life of the Hubble. Mikulski led a standing ovation at Goddard. An iconic Hubble photo dubbed “The Eye of God,” signed by grateful Goddard employees, hangs in Mikulski’s office. In the past few years, Mikulski has waged a similarly determined defense of the next-generation telescope, named for NASA’s second administrator. Billed as 100 times more powerful than the Hubble, the James Webb Space Telescope has been plagued by cost overruns and delays, its price tag swelling from an original $1.6 billion to $8.7 billion, its scheduled launch moved from 2011 to 2018. Frustrated by the escalating costs, House Republicans threatened to cancel the project two years ago, with Representative Wolf, who chairs the House counterpart to Mikulski’s science subcommittee, leading the charge. Mikulski, finding the increases and delays hard to defend, warned NASA that “my support is not unconditional.” Assured of caps in costs and regular Government Accountability Office reviews, she persuaded the Senate to provide $530 million for the telescope for FY2012 – and eventually persuaded Wolf, who’d set the House’s budget for the Webb at zero, to agree to the full amount. “The reality is the House zeroed it out because we wanted to force this issue of how are you going to deal with the cost overruns, particularly when we’re in these tight, tight budget times,” Wolf says of his negotiations with Mikulski. “I supported the Webb. She very much supported it. We just came at it from a different approach. I don’t think it was really as much of a tug or difference as it was a process. I think what we did forced NASA and the GAO and others to pull up their socks and tighten their shoelaces to get the project back on.” Mikulski didn’t lack leverage in dealing with Wolf since she funds NSF, headquartered in northern Virginia. One legislative observer said she and Wolf often appear to work as a “good cop, bad cop” team. In her first few months as Appropriations chair, in fact, Mikulski took some flak for agreeing to items she didn’t support, such as pay freezes for federal workers, a provision that allows biotech companies to escape litigation, and an amendment to a temporary spending measure that restricts National Science Foundation grants in political science. The American Political Science Association called that amendment “a devastating blow to the integrity of the scientific process at the National Science Foundation,” and scientists of all disciplines, and academicians, were alarmed. “A lot of us wondered why she gave in to that,” says Samuel Rankin, chairman of the Coalition for National Science Funding. Mikulski has defended her acquiescence on such issues as compromises necessary to avoid a government shutdown. Though Appropriations is traditionally one of the least partisan committees on the Hill – everyone wants money – it can’t escape the current budget impasse in Congress and a general shift away from comity and compromise. Many Republicans, including Shelby, are in no rush to cancel the across-the-board, automatic “sequestration” cuts since they’ve already helped reduce the deficit. “It’s probably a brutal process but not a bad policy,” the Alabama Republican says. By Susan Baer, a freelance journalist based in Washington, D.C.